"Is this rash of sightings the result of overactive imaginations? Or is it possibly something more?" The problem with UFOs�in large part due to their titular unidentified status�is that the lack of solid evidence makes coming to a "they're here" conclusion more of a leap of faith than anything else. But that hasn't stopped the believers (I'm raising my hand) from wanting to devour books and documentaries on the subject, analyzing the fuzzy video footage or strange photographs, listening to witnesses, and basically wondering why in this day and age of cameras everywhere someone somewhere can't get a better shot of one. 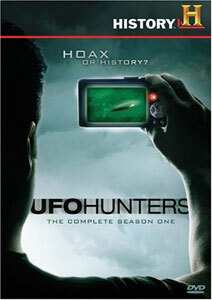 UFO Hunters is a History Channel series that debuted in January 2008, and this 13-episode collection tries to address the subject. It is hosted by a group of investigators who open their own set of "case files," do some exploring and conduct an experiment or two. Witnesses are interviewed, and if actual photo/video evidence isn't available (which is more often than not, unfortunately) the rest of the time is peppered with recreations full of mediocre CG work. It's fairly clear the hosts have a Mulder-worthy agenda, given that leader Bill Birnes is the publisher of UFO Magazine. Birnes, perpetually decked out in a UFO Magazine baseball cap and dark sunglasses, is the gruff boss, ordering around some investigative gruntwork for cohorts Pat Uskert, Dr. Ted Acworth, and Jeff Tomlinson, only to sometimes end up observing an experiment or lab recreation by John Tindall. Too bad the interactions between Birnes and company�in their UFO headquarters as they open a case file�comes off awkwardly staged (though I don't really know that for certain), giving it that scripted reality texture. It's meant to look like they're being briefed, or discussing this plan or that idea, but it all seems a little overdone and, well, corny. And if by chance it is all unscripted and au natural, then maybe they're just uncomfortable in front of the camera. Either way, it plays fake, and for me, became a distraction. Almost as much as Birnes' ever present UFO Magazine cap. I still believe the truth is out there. And so do the UFO Hunters, as far as I can tell. But this show gets weighed down by what I sense is too much of trying to force the "character" of the individual host/investigators, as they sometimes struggle to fill 44-minutes without repeating themselves. And that all gets in the way of what should be an objective, unbiased investigative piece. Image Transfer Review: Another frustrating nonanamorphic release of a series originally broadcast in 2008. That huge miscue aside, the transfers are pleasant enough, carrying generally consistent fleshtones throughout, especially when given the variety of locations the series is shot in. The overall color palette drifts a bit, and is more subdued than explosively vivid. Audio Transfer Review: Audio is available in 2.0 stereo for all 13 episodes.. Solid�but essentially no frills�this mix stays on the plain side of things. Voice quality and narration are clean, with no hiss. Plain, but more than suitable. Extras Review: This release matches the look of New Video's Monster Quest from earlier in 2008, as this four-disc set is also housed in an attractive steelbook case. Inside, each panel houses two discs. Episodes are cut into six chapters, with no subtitle options. The only supplements are found on Disc 4, entitled Additional Scenes (08m:17s), which are three alternate versions of segments from Crash & Retrieval, Military Vs UFOs, and Cops Vs UFOs. A postcard subscription insert for UFO Magazine is also provided. As with Monster Quest, not much in the way of extras, but the packaging is spiffy. Nice packaging can't overcome this series' two biggest problems: it was released in nonanamorphic widescreen and the general presentation sometimes borders on being overly dramatic. I'm all about UFOs myself�yes, I even recently attended a MUFON UFO Symposium�but I caught on that the hosts weren't really going to find anything smoking gun evidence, and that it's all interpretation and speculation amidst dodgy CGI. I have hopes that Season Two will tighten the belt a bit and give the series the stability it needs, but for now this Season One collection is just too uneven.